Messier 68 (M68) is a globular star cluster located in Hydra, the largest constellation in the sky. The cluster has an apparent magnitude of 9.67 and lies at a distance of 33,600 light years from Earth. It has the designation NGC 4590 in the New General Catalogue. Messier 68 occupies an area of 11 arc minutes, which corresponds to a spatial diameter of 106 light years. It is easily visible in 10×50 binoculars and best observed in medium or large telescopes. In binoculars, the cluster appears as a faint patch of light and one needs at least a 4-inch telescope to resolve the brightest stars. 6-inch instruments resolve the cluster’s outer regions and halo, which has an apparent diameter of 12 arc minutes. Large telescopes resolve stars throughout the cluster, including the core. 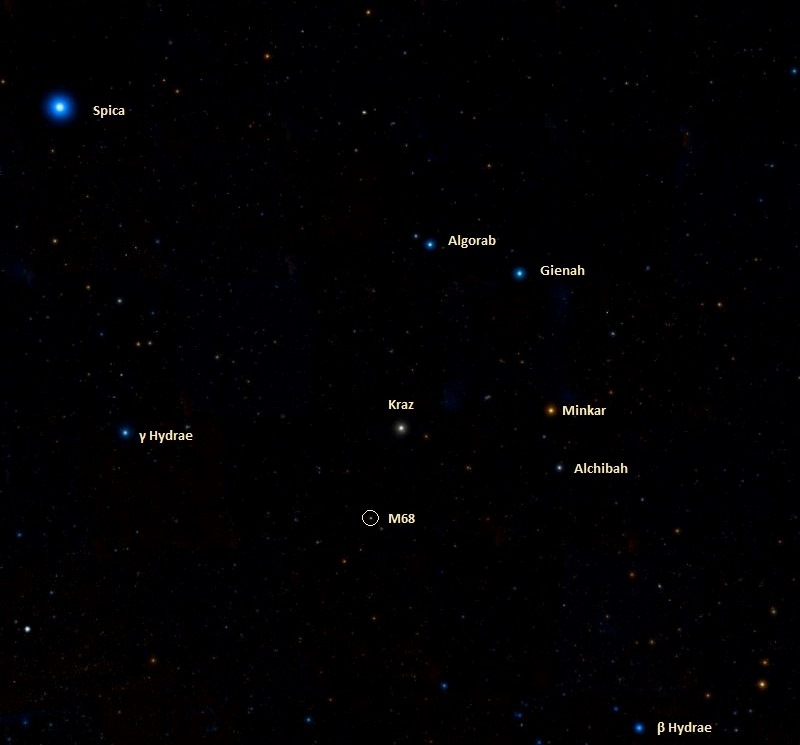 Messier 68 can be found 3.5 degrees southeast of Kraz, Beta Corvi, one of the stars that form the rectangle of the constellation Corvus. The best time of year to observe the cluster from southern latitudes is during the spring. It stays very low above the southern horizon for northern observers and is not an easy target. The NASA/ESA Hubble Space Telescope offers this delightful view of the crowded stellar encampment called Messier 68, a spherical, star-filled region of space known as a globular cluster. Mutual gravitational attraction amongst a cluster’s hundreds of thousands or even millions of stars keeps stellar members in check, allowing globular clusters to hang together for many billions of years. 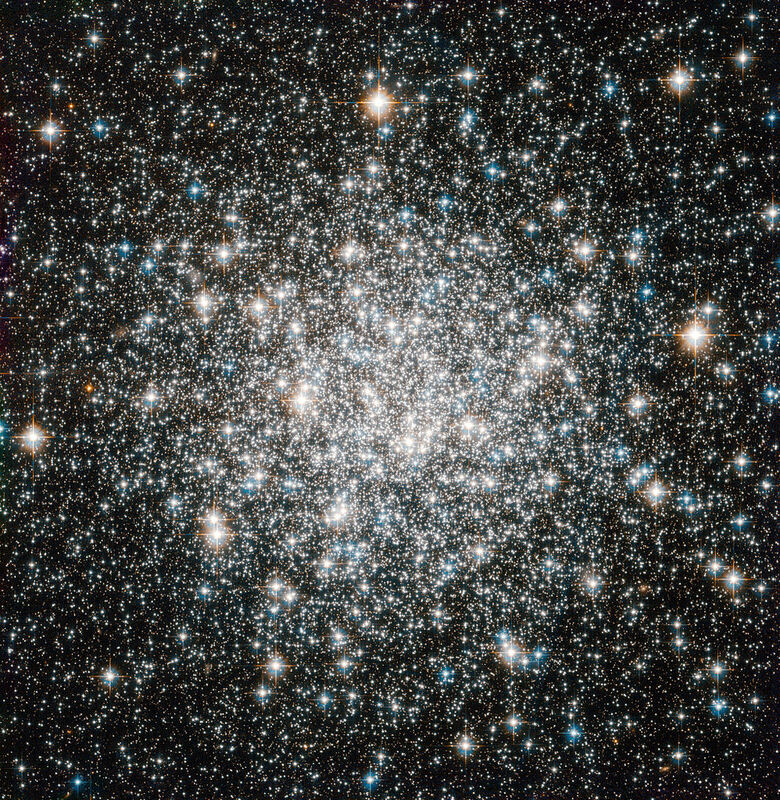 Astronomers can measure the ages of globular clusters by looking at the light of their constituent stars. The chemical elements leave signatures in this light, and the starlight reveals that globular clusters’ stars typically contain fewer heavy elements, such as carbon, oxygen and iron, than stars like the Sun. Since successive generations of stars gradually create these elements through nuclear fusion, stars having fewer of them are relics of earlier epochs in the Universe. 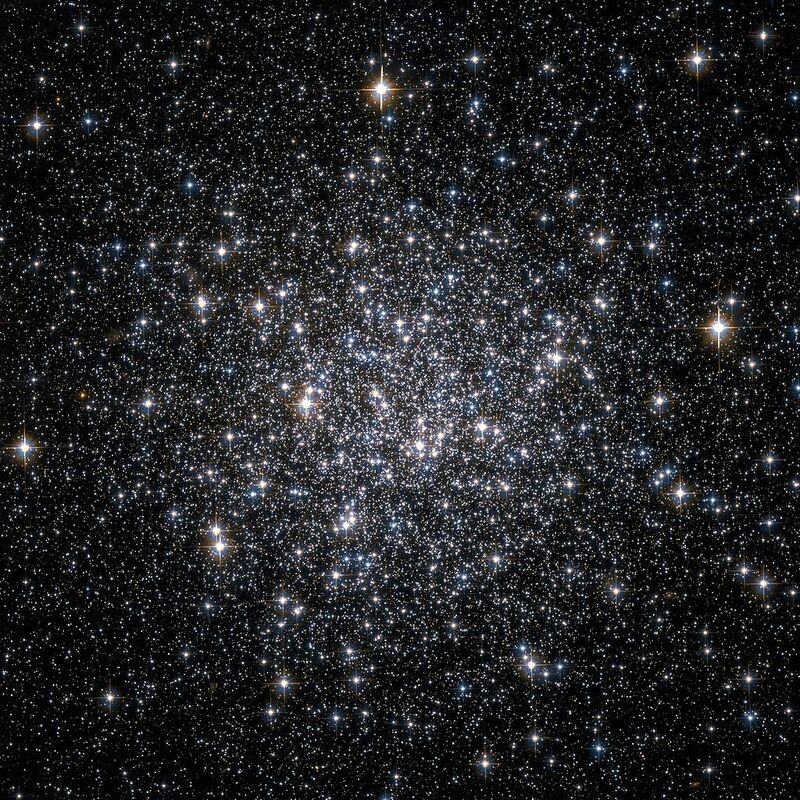 Indeed, the stars in globular clusters rank among the oldest on record, dating back more than 10 billion years. More than 150 of these objects surround our Milky Way galaxy. On a galactic scale, globular clusters are indeed not all that big. In Messier 68’s case, its constituent stars span a volume of space with a diameter of little more than a hundred light-years. The disc of the Milky Way, on the other hand, extends over some 100 000 light-years or more. 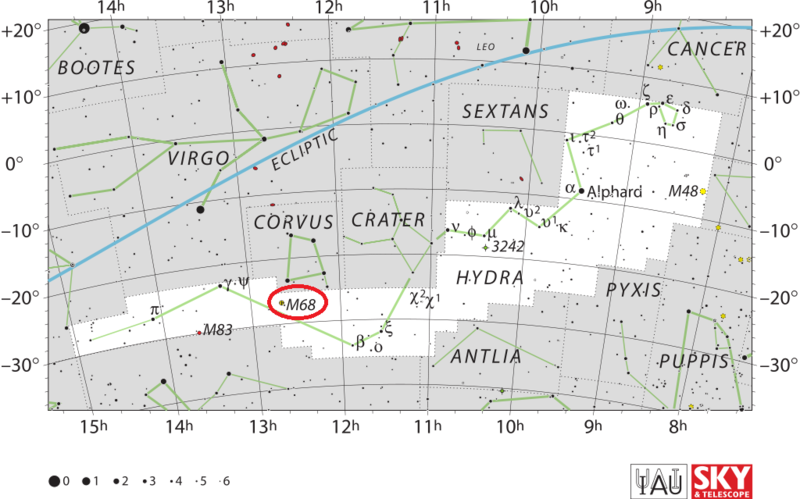 Messier 68 is located about 33 000 light-years from Earth in the constellation Hydra (The Female Water Snake). French astronomer Charles Messier notched the object as the sixty-eighth entry in his famous catalogue in 1780. Messier 68 lies in the direction opposite to the galactic centre and may have come from another galaxy, one of the dwarf satellites absorbed by the Milky Way in the distant past. The stars in M68 are very old and metal-poor compared to the typical stars found in the Milky Way. As the cluster is about 11.2 billion years old, the brightest stars have long burned out, leaving only dim, old members. With a density classification of X, M68 is one of the less concentrated globulars. Messier 68 has a mass of 223,000 solar masses and is probably home to more than 100,000 stars, of which at least 2,000 are visible. The cluster contains at least 42 variable stars and about 250 giants with an absolute magnitude greater than zero. 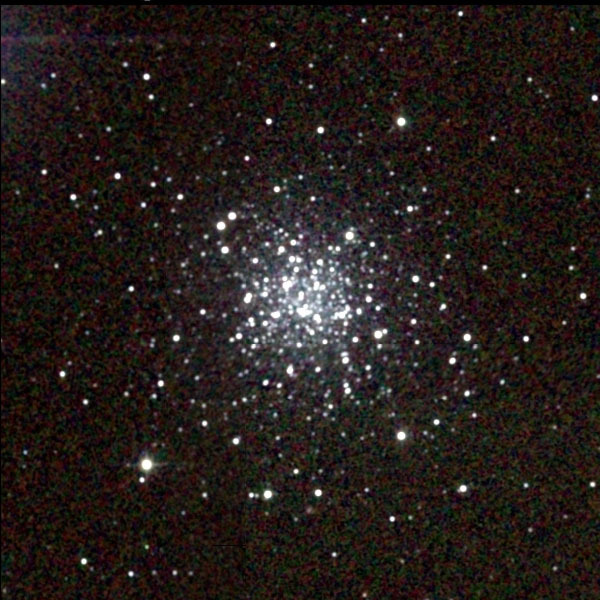 The clusters Messier 3 and Messier 13 have about twice as many. M68 has an overall spectral type A6 and has 25 stars brighter than magnitude 14.8. The single brightest star in the cluster has a visual magnitude of 12.6. M68 is approaching us at 112 km/s. A large round nebula on Hydra‘s body, under Corvus, discovered in 1780 by Méchain. In 1786, Sir William Herschel’s powerful 20-foot reflector resolved it into a rich cluster of small stars, so compressed that most of the components are blended together. It is about 3′ broad, and 4′ long; and he estimated that its profundity may be of the 344th order. It is posited nearly mid-way between two small stars, one in the np [NW] and the other in the sf [SE] quadrant, a line between which would bisect the nebula. It is very pale, but so mottled that a patient scrutiny leads to the inference, that it has assumed a spherical figure in obedience to attractive forces. Differentiated with Beta Corvi, from which it bears south by east, within 3 deg distance. Messier 68. Atlas Image obtained as part of the Two Micron All Sky Survey (2MASS), a joint project of the University of Massachusetts and the Infrared Processing and Analysis Center/California Institute of Technology, funded by the National Aeronautics and Space Administration and the National Science Foundation.